If you get to Florida by aircraft you can easily get to our privately owned luxury vacation houses in Cape Coral, Florida, in only 30 minutes from Southwest Florida International Airport (RSW), Fort Myers! There is no hassle regarding any shuttle bus transfers from and to the airport – you take over your rental car directly at the International Airport in Fort Myers! This makes vacationing easy! The ride from Miami Intl. Airport or the Fort Lauderdale Airport is only 2.5 h. If you arrive at Orlando Intl. you need approximately 3.20 h to get to our vacation houses in Cape Coral. Do not miss to scroll down on this page to see a list showing distances to or from our vacation homes in Cape Coral, Florida. To restaurants about 2 -2.6 ml. To the movies Marquee Cinemas - Coralwood 10, 2301 Del Prado Boulevard #900 and fitness centers only a few minutes! There are several golf courses in the area. Caribbean Island Dolphin View only 2-3 minutes. Cape Coral is cradled between the Gulf of Mexico and “The River“ a part of the Intracoastal Waterways - the real name is Caloosahatchee River. A string of Florida’s barrier islands are like a shelter for Cape Coral, which is worldwide known as a boater’s and golfer’s paradise. In your tropical backyard of your splendid getaway there are pristine and endless beaches as well as an untouched nature. World famous shelling beaches e.g. of Sanibel and Captiva Island and unique - mostly uninhabited -islands like the “Ten Thousand Islands“ are waiting for you. The Code will be changed with every rental. In the afternoon on the day you will arrive the key will be deposited in the key lock. Move the numbers of the combination lock and set them as you know it from using a lock from a Samsonite suitcase. Push the black bar (which is on the left from the figueres) downwards. The entire grey colored front will open machanically. After you opened the door, please put the key back into the box (this way the key is always available - you can easily lock yourself out when you leave the house through the garage), close the key lock box, change the numbers showing the current code to avoid anyone else might have accesss and draw down the cover above the combination lock. Endangered or threatened species like burrowing owls, gopher tortoises, manatees, dolphins and pelicans and a lot of other rare water birds like roseate spoonbills and American bald eagles – the national bird found their homes in this area. Whether you enjoy water sports, like golfing or get up early to see the sunset in this inviolated wildlife and nature loving it quiet - in this vacation you will be able to fulfill your dreams. 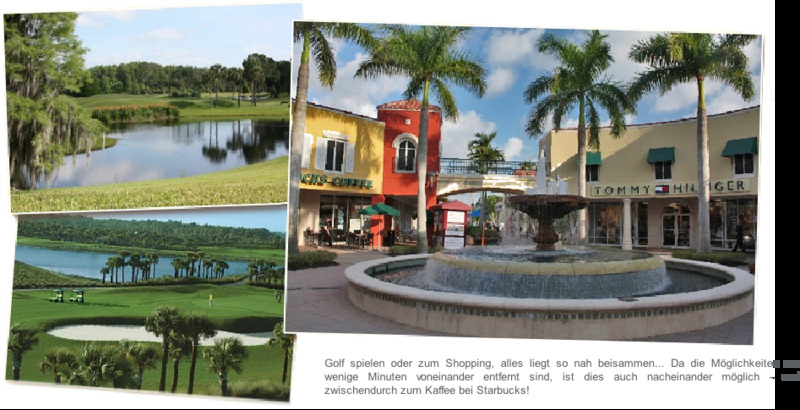 Fort Myers and Cape Coral offer some of the best golf in the area. Get a chance to try top rated championship courses providing players of all skill levels with a pleasurable and challenging round of golf. More relaxed "executive" courses are also easy to find. The median age of Cape Coral’s inhabitants is 42 years only. Reckless vacationers of all ages find a lot to see and to do in and around Cape Coral and Fort Myers, also called the City of Palms. The Red Sox JetBlue Park at Fenway opened in March 2012 and since then it is home of the Boston Red Sox during their Spring Training season. JetBlue Park is the home field for the GCL Red Sox, who play in the Rookie-level Gulf Coast League during the summer. Visit Cape Coral’s Sun-Splash Waterpark - for young and adults – just a few minutes from our vacation rental houses in Cape Coral, Children's Science Center, Mike Greenwells Family Fun Park or the Imaginarium or Thomas Edison and the famous Henry Ford's Winter Estates in Fort Myers, FL There are many shopping malls and outlet malls. Outlet-Malls . The famous Miromar Outlets are the largest in SW-Florida. 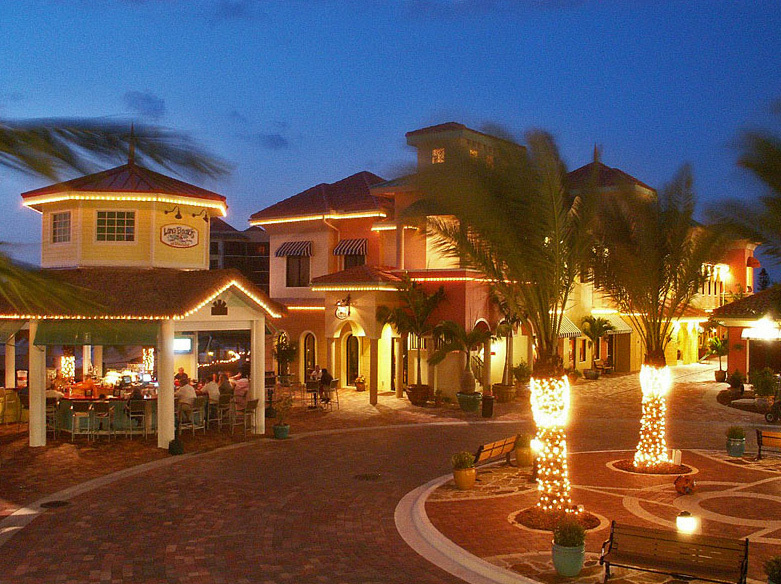 The Sanibel-Outlets feature also a wide range of stores. Information about riding times and distances are listed further down. Cape Coral and the area offers good food, you do not even have to leave Cape Coral as there are plenty of very good rated restaurants. Some places and clubs provide live music. You should also know that Cape Coral is one of the safest cities in all of Florida. Many repeating guests cannot fail. Do not miss to read the reviews. Stay in Paradise in the luxury vacation rental houses Caribbean Island Supreme Deluxe, Caribbean Island Grand Deluxe or the Caribbean Island Dolphin View in Cape Coral! Playing golf and shopping in the outlet mall on one day... Anything is possible as everything is that close. - There is even time left to get a good coffee or hot chocolate at Starbucks! It is an easy ride from all of our vacation homes, from the Caribbean Island Grand Deluxe you get to “the River“ East of Cape Coral in a short time and ride south on the river to get to the, so called “rivermouth“. If you start at the Caribbean Island Supreme Deluxe you enter the Caloosahatchee River south of Cape Coral. As the ride time to Sanibel and Captiva is the same, from this point of view you can rent either the Caribbean Island Grand Deluxe or the Caribbean Island Deluxe. You will reach the Gulf and the islands faster from the Caribbean Island Dolphin View. NO lock has to be passed if you head by boat from our vacation rental houses to the Gulf of Mexico. This is a pretty important information as you had to expect waiting time if you had to pass the lock and if it was closed for several days to to a repair you could not get out at all. The chance to see dolphins when you ride to Sanibel / Captiva Island is almost 100% and there are often Manatees to watch. If you consider renting a boat and have any questions, do not hesitate to contact us either by e-ail or by phone. We are going to inform you about everything you wish and need to know and help you finding the boat the meets your requirements. Do not miss the chance to see dolphins, manatees, bold eagles and other wildlife. Set the anchors at pristine beaches, enjoy lunch in a nice waterfront restaurant or have picknick at the boat. We are oing to let you know where to go and how easy it is to enjoy a beautiful day in boaters paradise, Cape Coral. You do not need any boat license and will get very good boat instructions to have enjoyable and safe boat rides. There is additional information under the menu Boats on this website on top. Florida, the well-known Sunshine State offers besides plenty days of sunshine and is also famous for family-friendly attractions like Walt Disney World, Sea World and Universal Studios in Orlando, Busch Gardens in Tampa and last but not least the Kennedy Space Center on the East coast. Florida has many more features besides Flipper- and Shamu-Shows and roller coasters in the theme parks.